ASM Aerospace Specification Metals Inc. is a world wide supplier of quality alloy steel metals. We are a pre-eminent alloy steel distributor who has proudly serviced the needs for over 30 years as metal and alloy suppliers to the world’s major Aerospace and Aero-Engine Manufacturers. We stock and distribute quality alloy steel from the finest mills in America and abroad. 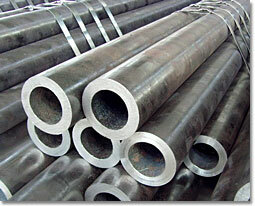 We supply a full range of alloy steel sheet and plate, tubing and pipe, forgings and shapes, and rod and bar. We also offer a range of preprocessing capabilities as well as experienced export capabilities. For more information or to receive a prompt price quote, please contact us at 800 398-4345 or submit the Request Information form on the right side of this page. The letter "E" prefixed before the number indicates that the alloy was electric furnace pro­cessed. All other alloys were either open hearth processed, or processed by the basic oxygen method, or it may be electric furnace processed with no adjustments made in the phosphorus and sulfur limits. The last two digits indicate the mid-carbon range contained within the alloy. Example: 4140 indicates the mid-carbon range of this alloy is .40%. If there is a five number series, the last three digits indicate the mid-carbon range Example: 52100 indicate the mid-carbon range of this alloy is 1.00%. Type 4130 is an electric-furnace processed, chromium-molybdenum aircraft quality alloy used primarily for welding or where moderate tensile strength is a requirement. The careful processing it undergoes completely eliminates the possibility of seams, grooves, pitting or blistering. It also undergoes diligent inspection and rolling to insure its freedom from lamination and tears. It is available in the normalized or annealed condition, and maybe pickled and oiled. Type 4130 finals its primary use in the aircraft industry where moderate tensile strength in com­bination with good weldability is required. 4130 is an electric-furnace, through-hardening, chromium-molybdenum alloy processed to meet the rigid standards of the aircraft industry and vacuum degassed to conform to the magnetic particle inspection standards of AMS-2301. Its excellent weldability, formability and temperate hardenability predispose this alloy to a wide range of applications. Normalizing without liquid quenching increases its strength sufficiently for most uses; however, it may be heat treated for greater strength. It may be nitrited for maximum wear and abrasion resistance. Type 4130 finds exceptional use where extremely high strength and hardness are required from relatively thin sections. It finds major use in applications requiring welding. It is extensively used in the aircraft industry for parts and components. 4140 is an electric furnace processed, through-hardening alloy processed to meet the rigid standards of the aircraft industry and vacuum degassed to conform to the magnetic particle inspection standards of AMS-2301. It contains .95% chromium and approximately .20% molybdenum. It has good fatigue, impact and abrasion resistance, and an extremely wide range of strength and toughness, obtainable by variations in heat treatments. In the fully hardened condition, it has outstanding tensile strength. It has a high fatigue and tensile ratio. 4140 may be successfully nitrited for maximum wear and abrasion resistance. It is remarkably well suited for use in extremely elevated temperatures. 4140 is generally used for applications of parts ½” or less necessitating a through hardening steel with strength as high as Rockwell "C" 50. Frequently used for fittings and forgings in the aircraft industry. E4340 is a highly alloyed, electric-furnace processed; vacuum degassed grade, which conforms to the rigid aircraft standards of AMS-2301. It contains approximately 0.8% chromium, 1.8% nickel, and 25% molybdenum. The combination of these elements assures deep and uniform hardness when heat-treated, particularly when oil quenched. It possesses exceptional ductility and toughness and remarkably high fatigue strength, snaking E4340 the steel to use for highly stressed parts operating under heavy-duty conditions. It also maintains its excellent strength and hardness while functioning under extremely	elevated temperatures. E4340 finds its most typical use in highly stressed parts that must operate under severe conditions. It is commonly used in the aircraft and missile industries. 8740 is an electric-furnace processed, chromium-nickel alloy containing approximately .25% molybdenum. It is primarily an oil hardening steel designed to provide excellent shock resistance and outstanding hardenability. It is a very tough alloy, especially free from temper brittleness. 8740 finds extensive use in the aircraft industry for parts and components. It is primarily used where high strength, hardness, and good shock resistance are required. Type 9310 is a vacuum degassed, carburizing steel containing approximately 1.25% chro­mium, 3.25% nickel, and .12% molybdenum. This alloy is suitable for heavy sectioned components because of its high hardenability and fatigue resistance, and because of its high core strength and hardness offering a narrow hardness range between light and heavy sec­tions. It offers excellent ductility and toughness, and may be used without carburizing. Most applications of 9310 do call for use in the carburized state, which increases its wear and abra­sion resistance to a high degree. It passes the most rigid magnetic particle inspections. Used principally in the carburized state where extreme core hardness is required in combination with a minimal hardness range. 552100 is an electric-furnace processed, vacuum degassed alloy containing approximately 1.5% chromium and 1.0% carbon. In order to maximize machinability and because of the high carbon content, 552100 may be spheroidize annealed. It is primarily a bearing steel possessing excellent resistance to wear and abrasion, medium toughness, and high strength in compression. It is a moderately deep hardening alloy with low softening resistance to elevated temperatures. 52100 finds its primary use in roller or ball bearing applications.